Our combination pitching machine and batting cage packages are not only the ultimate in convenient practice, but they are an outstanding value, too! 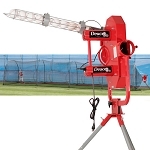 Featuring a variety of Heater pitching machines and several different batting cage sizes, there is certainly a combo pitching machine and batting cage package to suit your needs. Want a longer cage? Choose an Xtender batting cage and pitching machine combo and add more Xtender series cages to it! 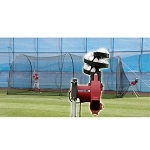 Select from a variety of Heater pitching machine and cage combination packages, below, and be sure to scroll to the bottom of the page for more information about these combos. When you purchase a combination batting cage and pitching machine from Pitching Machine Stop, you know you are buying a quality product. All of our Heater batting cage frames are made from flexible, yet durable fiberglass with polyethylene netting that is made to last. 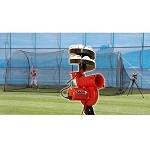 Our pitching machines are some of the safest on the market with enclosed wheels and rubber-tipped legs. Here, you can shop worry-free; each combo batting cage and pitching machine package features Heater's 30-Day Money Back Guarantee and One Year Warranty.